If you are someone who is going to take an interview of someone for the first time, then chances are that you might be even more afraid and apprehensive than the interviewee. What you ought to realize is that no matter what it is that you are feeling inside, you should not let this fear show on your face, because after all you are the one who needs to be impressed. If you are someone who has a natural flair for taking interviews then you will have no problems at all, yet if you think you might flounder along the way then here are some essential tips to help you to interview like a boss. What does ‘like a boss’ mean? A person who has been appointed to take interviews has to have a professional stance because after all he is representing the company and if he does not give a good impression then the person giving the interview might have second thoughts about, even joining the company. If you are someone with some experience of working in the corporate field then acting in this professional manner is not going to be tough at all. Sometimes in the course of your interview, withholding a laugh, smile or even a joke might be a little tough, yet you must ensure that you maintain decorum at all costs, lest you will lose your respect. A boss is someone who is very sure of himself and does not seek approval from others who are his subordinates. Similarly once you have been entrusted with the duty of taking interviews you must ensure that you do it to the best of your ability with no fear in your heart as well as trusting your own instincts. If you display any signs of nervousness then you will immediately be removed from the job as a person who is interviewing is expected to be cool, calm, collected and a tad bit intimidating. The moment you show some signs of weakness or vulnerability, then that is bound to bring about your downfall. 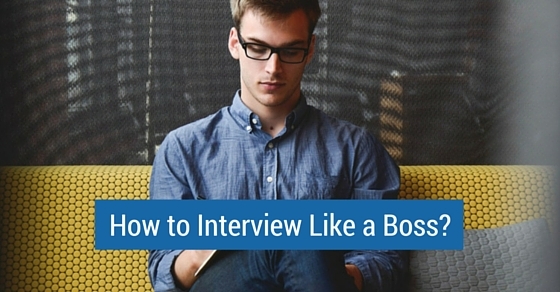 ‘Like a boss’ means having the aura like a head of a company is likely to have. A good boss will never ask you to respect him, rather the manner in which he conducts himself or the way in which he works is such that he commands the respect of those people around him. Similarly you must try your level best to command respect from those who walk into your chamber to be interviewed. Remember throughout the interview you have to take a neutral stance and ensure that you are only asking things necessary and related to the job. A boss is someone who is fair and never lets personal malice get into the way, and neither should you. No matter how new you are at taking the interviews of others, you should ensure that you do not let that influence your personal performance. You must show that you are someone who was born to do this and the company should be happy that they have selected someone as able as yourself to carry out this responsibility. If you are having some doubts at the outset, you need not worry as over time things will become clearer to you and you will get acquainted with the very intricacies of the job. It is often said that the first impression is the last impression, so the first thing a person being interviewed is going to see of you is the your attire. Believe it or not. an interviewee is going to be judging you and making an assessment of the kind of individual which you are as well. So ensure that you dress in the manner a person who is of such a high position is expected to dress. If your manner of dressing is slovenly and you look terribly unkempt with unpolished shoes and messy hair then that is something shameful indeed. In order to do justice to your position it is exceedingly important that you have an in-depth knowledge of the company. You should know what the company does, what it stands for, products it sells etc because then only can you gauge whether or not the person concerned is answering in a proper manner. In addition to this if the individual asks you a question and you yourself are unable to think of any logical answer then that is just going to be the worst things. If you have been working in the company at another position for a considerable period then you are bound to already know these answers. There are usually some standardized questions which are meant to be asked. Questions like the person’s greatest strengths and weaknesses, his most successful projects or even things like why he left his previous job, things like this are very relevant and they do give valuable insight about the individual. So do ask these questions in the course of the interview and based on the answer you can gauge if the person is able to speak well or if he has a command over the language. Things like this are otherwise rather tough to detect. In keeping with your position of his authority you should ensure that your manners and words are in keeping with the same. It would be terribly unbecoming of someone in your position to fumble a lot and to make use of colloquial language. If your spoken English is not very good then you should try your best to change this as soon as possible as having good communications skills is very important in this field. If you do not speak well, chances are that your questions are not even going to be comprehensible to the interviewee and if something like this does happen then it will certainly spell disaster for you. In order to ensure that your questions are not only good but properly applicable to the person concerned you should make it your business to acquaint yourself with his resume prior to the interview. Taking the time out to do this will really help you along the way. Yet if you do not have the time to do this for some reason or the other, what you can do is begin by asking the person to describe his resume to the best of his ability. Based on his answer you can gauge whether the person is able to speak in a precise manner or whether he is someone who rambles. While as an interviewer you might want to put the person being interviewed at ease this certainly does not imply that you act around as though he is your long lost friend. If you end up acting too friendly then you might end up giving the person some false hopes and making him believe that he has been able to bag the job. In addition to this you should make it a point to be polite at all costs. Do not make personal remarks at any point in time. Do not make the company doubt their decision of choosing you as a recruiter. Always do the job as best you can and your efforts are bound to be appreciated. As mentioned above marinating a neutral stance is very important indeed, but long with this you have to ensure that you do not make any promises to the person stating that he has a big chance of getting the job or that he is one of the best candidates that have applied for the job. Saying things like this isare not acceptable in any way at all. In addition to this a person who is responsible for taking interviews, in the course of his career might be bribed by a number of people desperate to bag jobs, yet you must ensure that you rise above this and never do something which could put your name in jeopardy. Make it a point to even ask some technical questions so that you can tell whether the person has some theoretical knowledge. Yet having technical knowledge alone does not imply that the person will be able to do the job well, do ensure that you ask some application based questions to gauge how quickly the person can think on his feet and whether or not he fumbles under pressure. A mark of a true genius in a field is when an individual is able to find some solution to the other even when big hurdles and obstacles happen to come his way. So ensure that you hire someone of this caliber. It is a well known fact that persons who take interviews are busy people and do not have a lot of time on their hands, yet you should ensure that you dedicate a proper amount of time for each interview and do not allot something as small as five minutes per interview. If you do not give enough time per interview then the candidate is not even going to be able to calm himself down and speak in a proper manner. Ensure that once you have put forth your question, you give him ample time to think about his answer and then deliver it in a proper and appropriate manner. No matter how much you have been able to achieve in the course of your career or how many awards you have been able to achieve, you should remember that the interview is not a time when you have to give your life story to the candidate rather it is a time when you have to gauge him as a person. For the sake of being polite, he is bound to listen to you but that does not mean that you take advantage of your position. The purpose of the interview is to find someone who is best suited to join the work force of the company and you can gauge his caliber by letting him speak more than you do. Finally it is very important to show that you are someone who respects the company and values the brand name above everything else. At no point in time should you think that it is alright to speak ill of the company or let out any company secrets which outsiders are not meant to hear under any circumstances at all. Once you have got into the thick of things and gained a little experience then you will find that the job is not very daunting at all and you can improvise and do things in your very own way. There are no distinct standards according to which you have to act, but there are certain protocols which you must keep in mind at all times. Remember that the decision which you decide to take is going to impact the company greatly so ensure that you are able to try and gauge the individual to know how they really are as individuals. Previous articleWhat is the Importance of Body Language during Interview? Next articleHow to Get your Resume Ready for Mobile Recruiting?